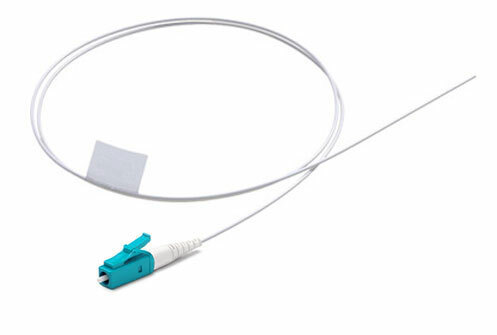 Multimode OM3 fiber optic pigtails, un-buffered, have an optical connector pre-installed on one end along with a period of exposed fiber at the other end. SC Fiber Optic Pigtails, Multimode OM3, 900um, up to 10 meters in length. FC Fiber Optic Pigtails, Multimode OM3, 900um, up to 10 meters in length. LC Fiber Optic Pigtails, Multimode OM3, 900um, up to 10 meters in length. ST Fiber Optic Pigtails, Multimode OM3, 900um, up to 10 meters in length.